I was on a mission: destroy my new toy! It started like this: Scottie Mom brought another one of those packages filled with the good stuff for us pups into the house. This time, she was smart enough to take the tags off everything before she set the box down on the ground and let us rummage through and have our picks. Just like last time, I found the bestest toy in the box and was off in a flash. This toy didn't squeak but it sure did make a sound! Scottie Mom said it made a sound she would prefer never to hear again. I told her not to worry - I'd take care of it straight away. It took me less than two minutes to get rid of that sound once and for all. 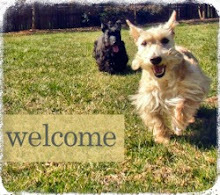 Clearly, my new "bestest" toy was not made for a Scottie like me. I bet Scottie Mom was glad she hadn't paid for it! As you can see in the video above, me and my new, bestest toy were inseparable from the minute it came out of the box. And, as you can see from the video below, it took me less than two minutes to destroy my new, bestest toy and before I knew it, the thing was deaded. It was at this point, Scottie Mom took my new, bestest toy away from me. I was very upset, having had only minutes of fun with it and attempted to stage multiple protests. She remained firm and said this new toy was simply not safe for Scotties. My bestest toy then disappeared but I knew it couldn't be far. I pretended to be all sad and gave her the most pitiful looks to convince her to give it back. Would you believe it didn't work? Scottie Mom went up to bed so Heather and I followed. Upon the discovery that my new, bestest toy wasn't there, I went back downstairs. Scottie Mom laughed and said, "You won't find anything down there, Mr. K." She waited a while but I refused to come back upstairs. She told me to suit myself, turned off the light and climbed into bed. That's when I knew it was time. Just as she was closing her eyes, I started my final protest of the night, making lots and lots of noise. As she hurried down the stairs, I sat my behind down and turned to watch her reaction. I had done what no Scottie had done before: pulled up a chair (which was tucked into the table quite nicely, I might add) and used it jump on the dining room table in search of my new, bestest toy. Once the light flipped on and I saw Scottie Mom's priceless reaction, I turned around and was about to make another ninja move by attempting to jump from the dining room table to the kitchen counter. Scottie Mom freaked out and intervened ruined my masterful plan. She asked me what I was doing. I told her I didn't know what she was so upset about. My kitty cousins jump on counters at their houses all the time. 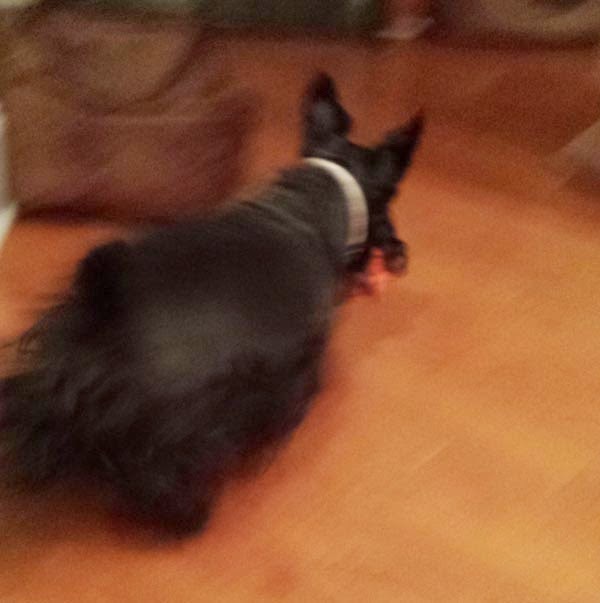 Why couldn't a Scottie in search of his bestest toy do it? She sighed, shook her head and suddenly, I was on the ground again. She pushed the dining room chair back under the table and left to make the bestest toy reappear again. I flipped out. My plan worked! 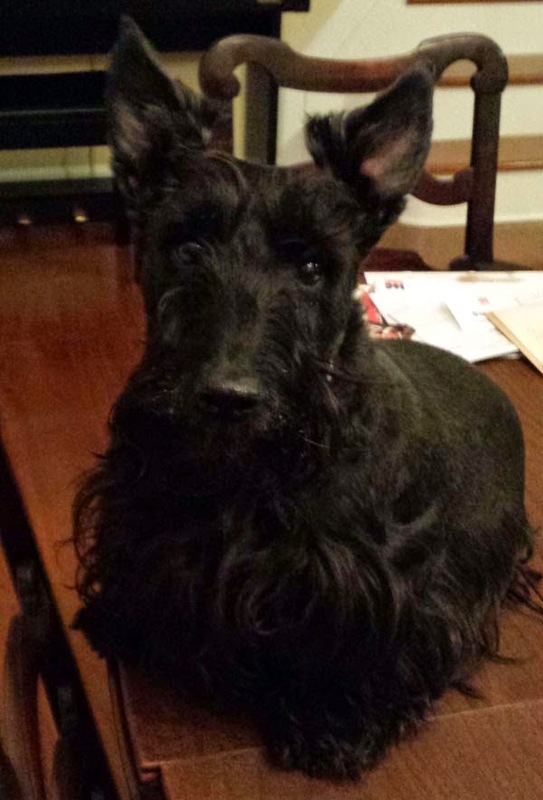 Don't look at me that way, Scottie Mom. I've done nothing wrong! I ran up the stairs behind Scottie Mom and my bestest toy. She shut the door behind us then turned to me and said, "you see this?" I nodded and waited ever-so-patiently for my bestest toy to drop on the floor so I could resume play time. Only problem: it never did. Scottie Mom locked it in the guest room bathroom! I vowed I would sit outside the closed door all night until she let me have it again but I got bored after a while and decided revenge could wait until morning. What I needed was a comfortable night's sleep. And the best way to achieve that was to be with Scottie Mom and Heather in the human bed. So, I walked around the bed to where Scottie Mom slept, put my front paws up and gave her my best "I'm sorry - won't you let me up?" eyes. You bet that look won her over! Scottie Mom picked me up and I snuggled up to her but kept my eyes on that closed bathroom door. Tomorrow, I thought, that door would meet its match and the bestest toy would once again be mine. What a great story! Love it! My Kelly girl enjoyed hearing the squeaky..
You stand fast Mr.K, one day you WILL win the war and bestest toy WILL come back! They're gonna need a new door and paint for it. Oh you had us hanging on your every bark!! What a story! We can't wait for the follow up...'cos we know there'll be one! We were on the edge of our baskets. We too can't wait for the next chapter when someone opens the guest bedroom door. Nice one. Have a marvellous mischief Monday. You are so smart Mr. K. I know you will find a way to win your bestest toy back. I hope you figure out how to get your bestest toy back soon! Wow, laughed sooooo much at this antic with seek and destroy mission - I thought my Scottie, Ollie, was the only one to have reinforced gnashers capable of destroying "indestructible" toys in minutes!!!!!! One day, some manufacturer will think of a toy that makes a sound that Scotties cant get to !!!!! OMgoodness....!! 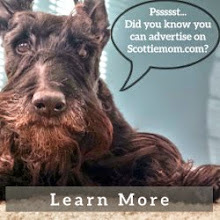 I see that I am not the only Scottie mom with a naughty Scottie. Well Mr. K you made me laugh very hard with your persistent antics and I am very happy I don't have to deal with you....I'm getting too old! Hugs Mr. K and kisses too! Not too many toys are "Tuff Enuff" for us terriers! Tenacious Toy Destroyers is what we are!! Terriers must be as tough as boxers! My brudder Max LUVS to destuff and desound every toy we gets! Our brother Jakey is also a toy destroyer!! Now Mama only buys us rag toys, or toys that she lets JAkey tear up!! Ha ha, it did make a funny noise! Look on the bright side - you did get to play with it briefly. They won't let me have toys like that at all - they say it isn't safe! Why Mr. K I don't know what to say. Pulling a chair up to get the bestest toy ~ helping yourself. Why would scottie mom think that was wrong. That's some great Scotttie mischief! I've never got up on the table before, great job buddy!